"Creativity is the quality you bring to the activity you are doing. It is an attitude, an inner approach- how you look at things..."
Painting from the Inside Out offers a container for our creativity. We show up with the best of intentions. We want to be creative. Creativity holds all of who we are. We cannot escape ourselves. This becomes apparent as you stand in front of a blank sheet of paper. You may feel excitement to finally paint what you have always wanted - without limitations. You also may feel anxiety with nobody there to tell you what to paint. Or you may begin feeling great and suddenly you are stuck, which may hide other feelings you thought you could leave behind. What has happened? Where has your creativity gone? It is not about leaving behind or ridding yourself of feelings! We feel all the time. We are moving all the time, whether feeling, sensing, or thinking. However our ideas and judgment of how it should be have boycotted our movement. So we think: "the painting doesn't look artistic, it does not look the way I want. It is ugly etc ". So a gap is created between what we want and who we are. We experience this gap as suffering. We are putting our thoughts and ideas inside the container instead of the full expression of our creativity. Painting from the Inside Out offers a way to learn to live creatively; to ask the questions that ignite your inner movement and that change your attitude towards life and self. 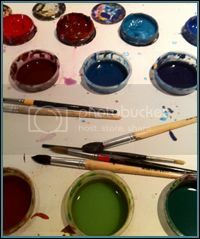 Experience how awakening your creativity within the painting process can change you! Contact Caren for details: cborowsky@comcast.net or Eve-Marie @ www.evemarieelkin.com for info. Please call Eve-Marie at 914.844.6213 to reserve your space or for more information on any of the above. Final thought: We also use the lens of family constellation work to look at what is blocking us, and discover how to unlock the courage and energy to create.